AS RESPONSIBLE CPAs, I KNOW THAT YOU KNOW HOW IMPORTANT PLANNING IS. MARKETING PLANNING IS NO EXCEPTION. Identifies who is responsible for doing what by when. Helps you focus your time and budget. Includes SMART goals along with specific action steps for achievement. Ask yourself: Where are we now? Where do we want to go? How do we get there? If you need help to answer these questions click the button below. 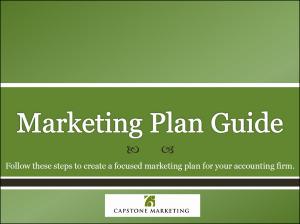 I can help you create your CPA firm marketing plan. Then, I can provide assistance in implementing specific projects or serving as your firm’s virtual marketing professional. In the meantime, enjoy the complementary downloads below and my published articles. 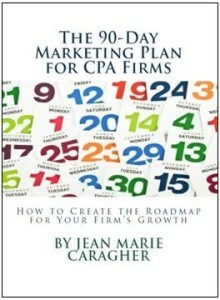 Consider buying my book, The 90-Day Marketing Plan for CPA Firms: How to Create Your Roadmap for Your Firm’s Growth. It includes practical step-by-step instructions, worksheets, examples, real-life case studies, and exclusive research findings to show accounting firms of any size or shape how to create a reliable roadmap for growth in only 13 weeks. The book also includes an extensive glossary, bibliography, and an appendix of forms and worksheets, which are also downloadable. 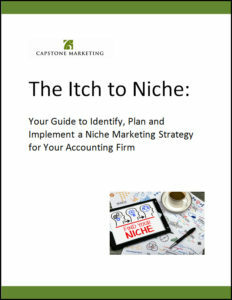 April 2008 – Expand Your Horizons: Niche Marketing Success Stories, Journal of Accountancy, Niche marketing has become a successful strategy for many CPA firms because it identifies target markets and resources, distinguishes a CPA firm from the competition and generates higher profit margins. This article will provide you with the keys to successful niche marketing as well as niche marketing success stories. June 2007 – Manage Marketing with a Budget, CPA Practice Management Forum – Partners continue to demand a return on marketing investment. This article is helpful to both veterans and budget first-timers. August 2006 – Practice Profile: Spotlight on All Assets and Aspects of a Business, Practical Accountant – A profile of a Capstone Marketing client, Tauber & Balser, P.C. June 2006 – Think Strategically: Align Marketing Efforts with Firm’s Vision and Goals, Written or Otherwise, CPA Practice Management Forum – Strategic marketing is about aligning marketing efforts to the firm’s overall goals and initiatives. Read this article and learn from several marketing and sales professionals. December 2005 – Seminar Best Practices: Careful Thought, Attention to Details Make for Successful Events, CPA Practice Management Forum – This article includes advice on planning and follow up from marketing specialists. May 2005 – Putting Your Best Face Forward, Accountants Media Group Special Report – The top three marketing tools that generate the most leads for CPA firms are networking, mixers with referral sources, and seminars. Learn more about each of these marketing tools. November 2001 – Partner Goals Inspire Firm Marketing, CPA Marketing Report – This article focuses on a Capstone Marketing client, Porter Keadle Moore, and the launch of the firm’s first marketing program. 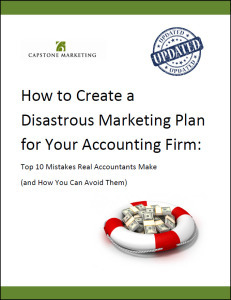 Leading CPA firms attribute their success to using a GPS – also known as a marketing plan. When an entire firm understands and endorses its marketing plan, the firm and its employees will reap the benefits.